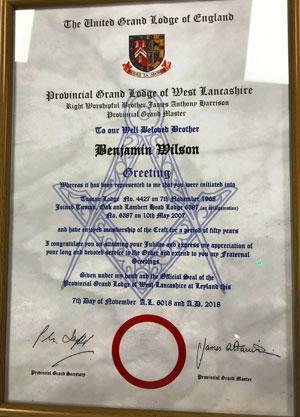 Members of Tuscan, Oak and Lamberthead Lodge No 6387 were proud to host the celebration to commemorate the outstanding contribution to Masonry of one of its elder statesmen, Ben Wilson, who was initiated 50 years ago. Assistant Provincial Grand Master David Ogden was delighted to attend the meeting at Pemberton Masonic Hall to celebrate with Ben his achievement of 50 years’ service in Masonry. David (left) congratulates Ben Wilson on achieving 50 years in Masonry. David was accompanied at this very special event by fellow grand officer and Wigan Group Chairman Geoffrey Porter and Provincial Junior Grand Warden Barry Dickinson and supported by Ian Halsall, Provincial Deputy Grand Director of Ceremonies. Acting Provincial grand officers Eric Bailey (PrSGD) and Geoff Whittle (PrGStwd), together with Group Secretary Chris Reeman completed the entourage. The lodge was opened for business, following which the APrGM and distinguished guests were received into the lodge and warmly welcomed by WM Alex Hammond, who had no hesitation in offering David the gavel, and was delighted when he retained it on this very special occasion to conduct the proceedings. David stated that he was delighted to be at Pemberton to celebrate a very special occasion, the 50th jubilee of a very well-respected Mason. David then entertained the brethren by recounting the story of trying to find Ben’s house when he went to chat to him about the upcoming event, followed by a quick mention of what was happening in the world in 1927 when Ben was born and in 1968 when he joined the Craft. David (left) presents Ben Wilson with his celebratory certificate with Geoffrey Porter (right) looking on. David then called on Ian Halsall to place the celebrant in front of the pedestal, and when comfortably seated he proceeded to recount details of his life and Masonry to the assembled brethren. Ben was educated at St Paul’s Infants and Juniors and then on to Highfield Secondary School for boys, before starting work at the age of 14, for William Park and Company as an office clerk, in their head office in Wigan. The company may have changed its name, but Ben continued in the same employ for over 50 years. He was called up to national service in the Royal Air Force, and after basic training was further trained as a GPO counter clerk and was able to work in any camp Post Office and qualified to run a Post Office. Ben served in the UK before being posted overseas to Cairo. He was promoted to corporal and returned home in 1948 and was demobbed. Previous to his return to Blighty and normality in 1948, there was a girl he had known since 1942, and friendship blossomed during the service years. They began to date, got engaged in 1949 and in 1951 she became Mrs Irene Wilson. They had two daughters Helen in 1957 and Jane in 1963, both who have since gone on to get degrees, become married and make their own way in life. Ben played football for his church team until 1952, when the team resigned from the Wigan League. Following this he started a career as a football referee in the Wigan Sunday School Leagues, which he continued until 1974. He also became registration secretary for the league and later chairman. In 1969 he moved house from Newtown to Highfield Grange and became the secretary of the parish church council and sang in the church choir until his voice started failing in 2000. Ben’s wife ran a grocery business that he had bought in Newtown and was allowed to help out on a Saturday morning before the match. Irene was also secretary of St Paul’s mother’s union. She had to unfortunately retire when she became ill with a blood disorder, to which she finally succumbed and passed away in 2009. They had been married for 59 years. In the Craft, Ben was initiated into Tuscan Lodge No 4427 in November 1968. Secretary Martin Stokes read the minutes from the meeting from 50 years ago, bringing many happy memories back. Ben served twice as WM (1980 and 2005) and served as secretary for 13 years. He received Provincial honours as PPrSGD in 1990 and was promoted to PPrJGW in 1997. David summarised Ben’s life as a life of devotion and commitment, to his family, (being married 59 years), to the church (serving 31 years in the choir), to his work (50 years with the same company), to his community (as secretary for the parish church council, secretary and Chairman of Wigan Sunday School League and as a referee). 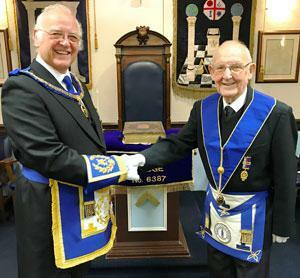 His commitment to Masonry is now recognised by 50 years membership. 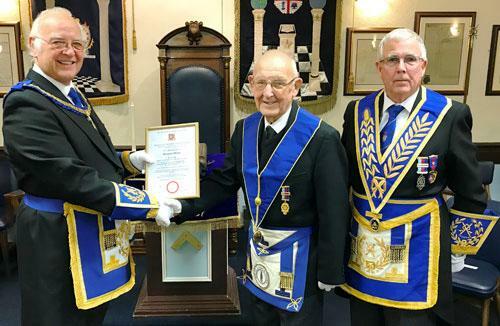 David was absolutely delighted at the chance to honour such a worthy Mason and invited Geoffrey Porter to read out the certificate from the Provincial Grand Master Tony Harrison which David subsequently presented to Ben. At the end of the proceedings, David invited Ben to retire with him after the first rising and they joined together in saluting the WM as they left the lodge. Pictured from left to right, are: Geoff Whittle, Chris Reeman, Barry Dickinson, David Ogden, Alex Hammond, Ben Wilson, Geoffrey Porter, Eric Bailey and Ian Halsall.